Videocon D2h Weekend Offer: Get ZEE TV HD for Just 1, Videocon is again back with its weekend offer, Now Videocon is offering ZEE TV HD for Just 1. The offer can be availed any time between 00:00 hours on 8th February 2019 to 23:59:59 hours on 10th February 2019. So follow below steps and avail this offer. The offer can be availed any time between 00:00 hours on 8th February 2019 to 23:59:59 hours on 10th February 2019. How to Get ZEE TV HD for Just 1? First of all Open your phone Dailer. Then dial 18003150001 from your Videocon D2h Register mobile number. You have successfully subscribed to ZEE TV HD channel at Rs 1 only. Cancel this subscription next month otherwise you will be charged as per the channel price. 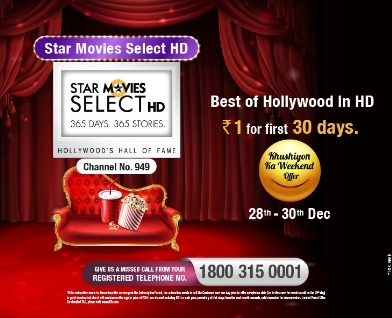 You must subscribe to ‘ZEE TV HD’.on the Offer Days between 00:00 hours on 8th February 2019 to 23:59:59 hours on 10th February 2019.